This quote by Ralph Ransom perfectly sums up my thoughts of late. Life is a series of steps. 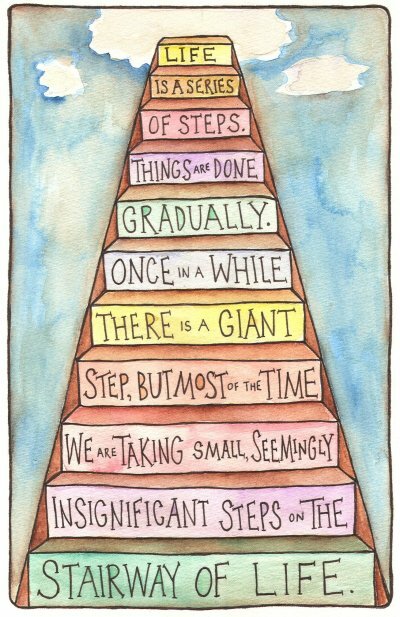 On a day-to-day basis, those "small, seemingly insignificant steps" don't appear to lead anywhere. I have to continuously remind myself that I'm making progress even when it feels like I'm not. I wouldn't mind taking a few giant steps to get where I want to go a little faster, but those only happen once in a while. Things are done gradually. Patience is good. Perspective is better. Another wonderful piece. Love the quote. Brilliant - a truly awesome take on the prompt. So pleased to have found your blog...off to explore some more! "Life is a journey, not a destination..." ~ Ralph Waldo Emerson. I have to remind myself of that, too. I always want to be somewhere else but should just be enjoying the present. i love it. i love it, i love it, i LOVE it! every single step of it!